Zizyphus Spina Christi is a desert plant. The leaves were powdered and used to wash hair before shampoo was available. It leaves hair clean, shiny, healthy and well conditioned. It does not leave any color in the hair. If your hair has been chemically bleached, please test first, the results may be peculiar. people who can't use any soap or detergent to wash their hair. 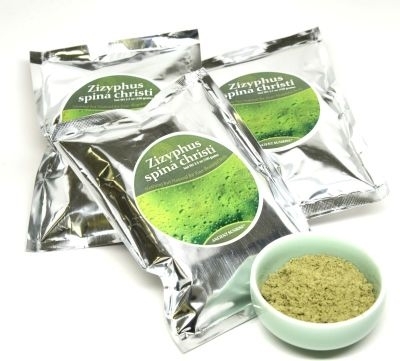 Mix Zizyphus Spina Christi with water until it is a paste about as thick as yoghurt. Section your hair, and apply the paste. Work the paste throroughly into your hair. Let it stay in your hair for twenty minutes. Rinse your hair completely with hot water. 25 grams of Zizyphus will clean and condition your hair. If you are allergic to latex, please do a patch test before using zizyphus spina christi. There is a rare, but documented cross-sensitization between people who are allergic to latex and zizyphus spina christi.